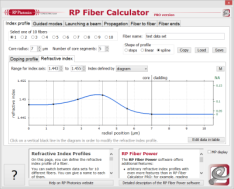 The RP Photonics Buyer's Guide contains 20 suppliers for fiber cleavers. In fiber optics, it is often necessary to prepare clean surfaces for optical fibers. This is often done by cleaving, i.e., by controlled breaking. Instruments used for that purpose are called fiber cleavers. For general aspects of cleaving, such as basic principles, problematic cases and the inspection of cleaving results, see the article on fiber cleavers. The simplest cleaving method uses only a diamond blade, incorporated into a pen-shaped scribe, with which one manually makes a tiny scratch on the fiber, in a direction perpendicular to the fiber axis. (Note that too strong scratching can spoil the results.) One then holds the fiber on one end and gives the other part a kick with a finger, so that the cleave occurs. Alternatively, one may pull the fiber. Such techniques require some practicing, and the results are somewhat variable. Simple and inexpensive mechanical cleavers can be part of fiber termination kits. They produce less consistent results than high-quality precision cleavers, as described below. At least, their use requires more practicing, and normally such devices are applicable only to standard silica fibers. The fiber is inserted into the cleaver (after stripping its coating) and fixed, typically with a V groove and two clamps. By turning a handle, one then applies a tension, the magnitude of which can often be adjusted (e.g. with a screwdriver). That tension alone is not sufficient to break the fiber. With a second handle, one now carefully lets a diamond blade approach the fiber, causing the required scratch. The blade may be made vibrating with a small electromagnet or piezo. Finally, the tension is increased so that the fiber breaks. With some cleavers, the tension during application of the blade is already high enough for the fiber to break. There are versions of mechanical semi-automatic fiber cleavers which also allow for angle cleaving (see Figure 1), i.e., for preparing fiber ends with some angle against the fiber axis. For that purpose, the fiber is somewhat twisted before it is cleaved. Tentatively, stronger twisting leads to larger cleave angles, but that relation also depends on the tension, and there can be a substantial variation of cleave angles from try to try. Figure 1: When light comes out of a fiber with angled cleave, it will be somewhat deflected. The direction for reflected light is also shown; it will not go back to the fiber core. Some precision fiber cleavers are part of fusion splicing apparatuses, as precision cleaving is a prerequisite for successful splicing.